A printer that does everything isn’t hard to find. The printer industry is fairly competitive, and new models are pushed out every year. Even though you only see truly significant additions every five years or so, even smaller incremental improvements can amount to something greater. Though it’s getting hard to imagine what kind of ways printers may continue to improve, brands like Canon seem to keep finding new ways to reinvent simplicity. 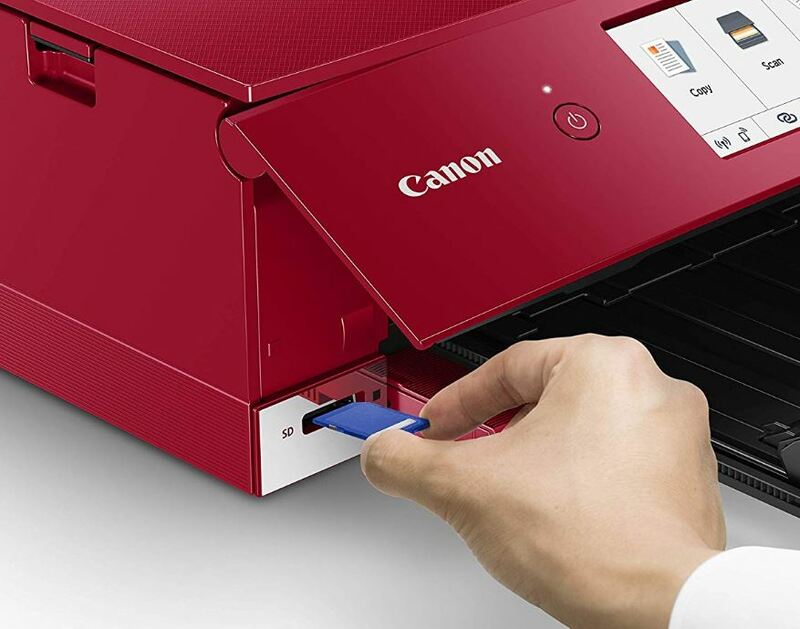 The All-in-One line of Canon printers are a combination of many essential home office features, like scanning, copying, and printing. Some years ago, faxing was an integral part of the all-in-one approach as well. But these days, Internet connectivity features have usurped the position of fax features, or otherwise relegated them to the bottom of an obscure menu. To sum it up quickly, the Canon TS8220 is a mid-range printer, but it feels like a high-end printer. That’s partially because it’s inherited so many features that used to be exclusive to high end devices, features like wireless connectivity and LCD touchscreen controls. And partially because of a widely robust feature set paired with versatile support for paper media. The TS82200 is slightly more sophisticated than most traditional color printers. It makes use of a six-color ink system, which allows it to create particularly sharp prints. Though the very best color prints still require highly specialized equipment, the TS8220 gets close to that level of excellence. But what else can it do? Most printers look about the same. It’s probably because most printers are made by two or three manufacturers. When every car was made by a couple of businesses, cars also tended to look the same. However, the TS8220 is actually slightly different. Not only in its flat form, but in color. The TS8220 is available in red, black, and white. Having three options for color is precisely two more options than most printers provide. 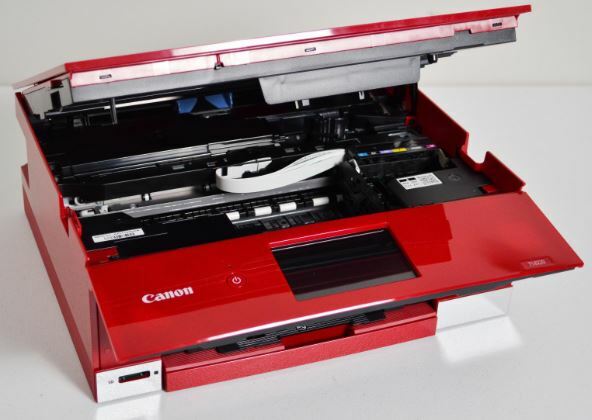 The Canon TS8220 has a box-like design, with each corner of the device leading a flat edge. The topside is flat and square, the base is flat and square, and the paper-feeder is flat and square. Even the LED display and the panel it’s resting upon are flat and square. The topside also hides away a flatbed scanner, which is also flat and square. Giving no pretense of portability, the TS8220 Wireless All in One weighs about 14.5lbs. Its body measures 14.7 x 12.8 x 5.6-inches, or about 1.5” wider when you insert paper. It’s clearly intended to take up a stationary position within an office, though it’s not too large to fit on most office printer stands. On the front-face of the Canon TS 8220 Wireless All in One is a 4.3” touchscreen LCD. It’s a full-color replacement for the old black and white 3-line screens Canon printers used to use. On the home page of the screen, the three largest buttons are copy, scan, and print. With a few taps, you can access essentially every other function within the printer. Great connectivity options have been pretty standard on printers for a couple of years now. For example, even the cheapest printers on the market typically can offer some form of wireless connectivity. The TS8220 Wireless All in One can connect through high speed USB-C, Pict Bridge wireless LAN, Wi-Fi on the 2.4GHz band, Bluetooth 4.0, and Bluetooth LE. And it supports connections through almost any SD card you might consider using, including SD, mini SD, microSD, and so on. In short, there’s basically a limitless series of ways that you can get your devices to communicate with the Canon TS8220. Instead of choosing from just one type of wireless, or just one type of SD card, the Canon TS8220 gives you everything but the kitchen sink. That makes it easy to give this printer an A+ for connectivity. The Canon TS8220 Wireless All in One provides full native support for Amazon Alexa, Google Assistant, and IFTTT. If you’re interested in integrating a printer into a smart-home setup, you couldn’t ask for better options. It should surprise few people that Canon has their own printer app. The app uses an interface that’s actually quite similar to the one used on the 4.3” LCD. As you get familiar with one, you become familiar with the other. And that makes it pretty simple to control your printer from anywhere. 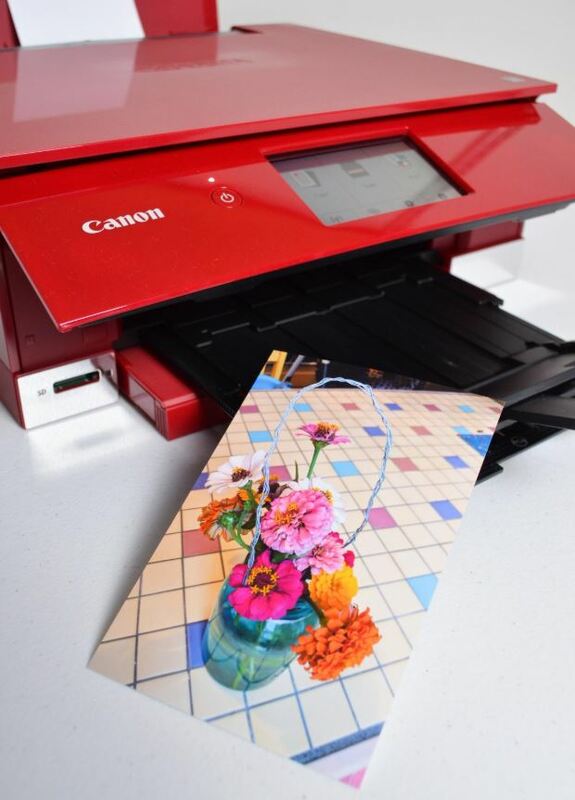 The Canon PRINT app isn’t the only app you can use with the TS8220, it also includes Message in Print and Easy PhotoPrint Editor. They’re somewhat simple and approachable editing tools that can be used to help spice-up your prints. 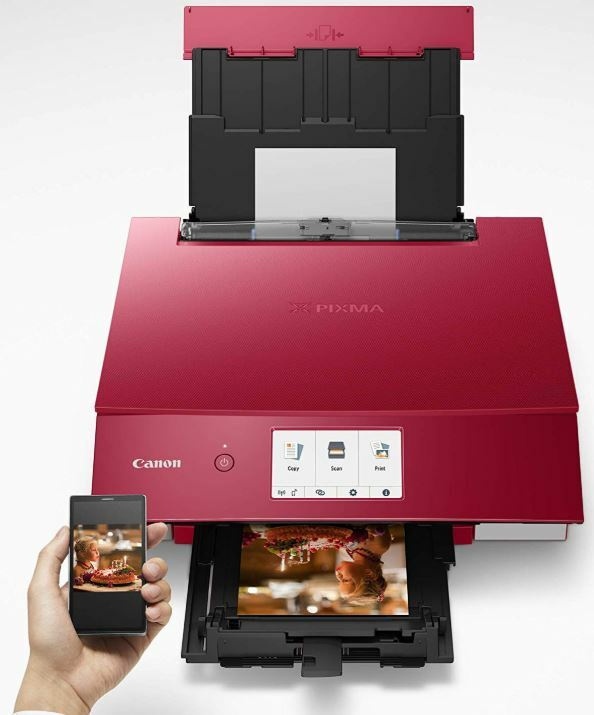 In addition to mobile apps, the Canon TS8220 Wireless All in One includes a scan utility program, and a copy of the necessary PIXMA TS7220 printer driver. The TS8220 is built with a standardized document tray measuring 8.5 x 11.7-inches, which corresponds to A4 letter paper. It also supports essentially every common smaller format, including 3.5 x 3.5-inch photo paper. Like most home office equipment, you won’t be pulling giant banners or posters out of this printer. The maximum rear tray capacity is 100 sheets of paper, or about 10-20 sheets of photo paper. It depends on the thickness of the paper. The front paper cassette can handle an additional 100 sheets of plain paper. The TS8220 enjoys wide compatibility with many types of paper. That includes plain paper, glossy paper, high glossy, semi glossy, super glossy, and of course matte paper. It also includes fine art paper, greeting cards, printable CD/DVD/Blu-ray discs, t-shirt transfers, and #10 envelopes. For color prints, maximum optical resolution is 2400 x 4800 dpi. And whether you’re using full-sized photo paper or making smaller 3 x 5 prints, they come out looking quite vivid because the TS8220 makes use of 16-bit color depth per RGB channel. High optical resolution and great color depth combined is really what helps the Canon TS8220 shine. There’s little question that the TS8220 can make great looking prints. That’s not wholly surprising because Canon makes plenty of great printers. But the thing that makes the TS8220 special is its photo blue ink tank, which is the key component behind the 6-color ink system. Without getting into all the details of how one color interacts with another, the fact this printer has its own special blue ink tank allows it to reduce graininess while creating higher contrast prints. Depending on the paper you use, these prints can favorably compare with professional quality prints. But how long do the prints last? With the TS8220 Wireless All in One, Canon is using ChromaLife100 technology, which is intended to protect photos for quite some time. Inside a photo album, you can expect about a century of protection from fading. Colors last about three decades when placed behind glass. Without glass, an unprotected photo can still manage to keep its vivacity for about 20-years. The TS8220 was built to feature AirPrint and duplex printing. It makes use of an auto-expandable output tray, automatic print head alignment, and an automatic power on/off feature to minimize power consumption. It can also operate in a special quiet mode to reduce noise output, though doing so will slow down the operation of the printer. None of these features are particularly unique or impressive for a printer in this price range, but they all perform with the kind of excellence you’d expect from a mid-range Canon printer like the TS8220. To put it simply, it has every feature you would expect or want from a home office printer. 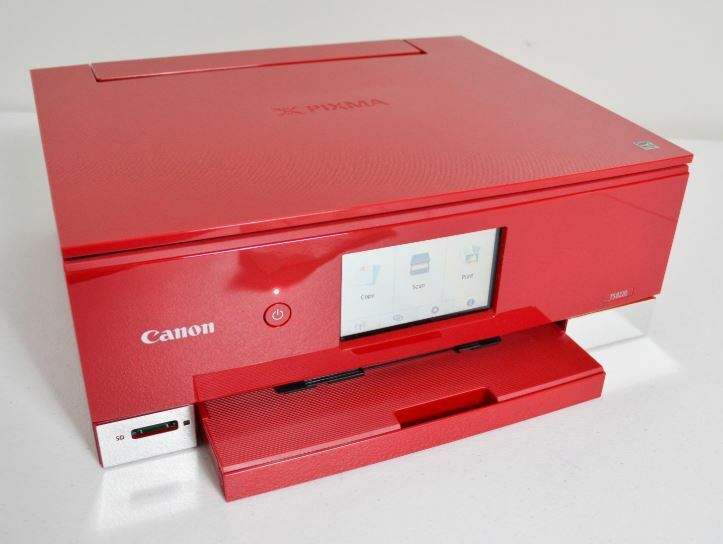 The Canon TS8220 Wireless All in One can copy a color sheet in about 20 seconds. Once it has your data, the scanner can attach it to an email, or save those scans directly to a PC on your network. You can scan wirelessly and automatically. And when you’re done, the TS8220 will remind you to remove your document. Apart from that, the copier has every essential feature. That includes things like auto exposure copy, borderless copy, disc label, fit-to-page, ID card copy, multiple copy, two sided copy, photo enlargement/reduction, and so on. The ink is available in extra-large cartridges, which is slightly more economical than the ordinary cartridges. Canon has some decently economical ink delivery and ink subscription services that can slice down the price of ink further. The Canon TS8220 Wireless All in One supports Windows 7 and beyond, and Mac OSX 10 and later. With respect to mobile operating systems, iOS, Android, Windows 10 Mobile, and Amazon’s Fire OS are all supported. Canon includes a 1-year warranty with the TS8220 Wireless All in One. They also have an Instant Exchange program. If there’s a problem with your printer and you need a replacement immediately, their program can help get you back to work as soon as possible. Who Should Choose the Canon TS8220 Wireless All in One? 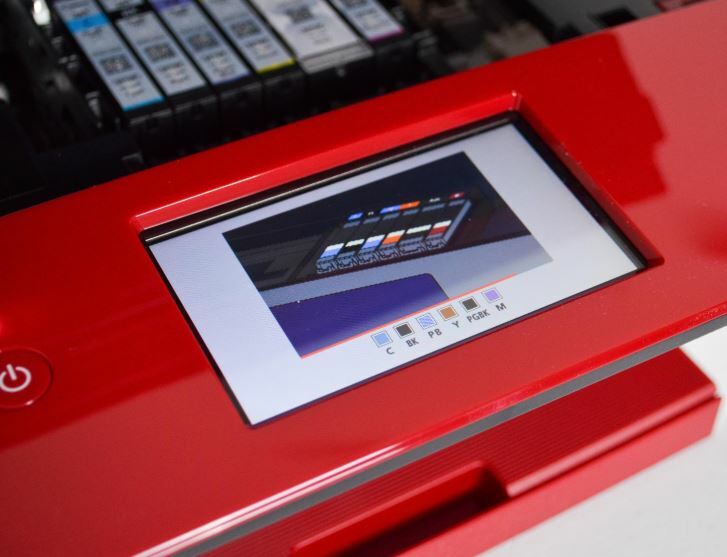 The TS8220 provides somewhat luxurious features like duplex printing, along with wide app and software support. The 4.3” LCD Touch Screen makes using the TS8220 as simple as using a phone. And yet it’s powerful enough to create rich color comparably to any other printer in this price range. These factors combined make TS8220 capable of taking on virtually any project or workload. It’s certainly great for printing family photos, reports, tickets, and similar documents. At least, for a home or small office setting. If you’re looking to have a dozen people make active use of the printer all day, then you’d need a printer built specifically for high throughput. Provided you’re not anticipating high throughput, the TS8220 has essentially every feature you could want from an all-in-one printer. And if you make extensive use of your printer, that list can be pretty lengthy. 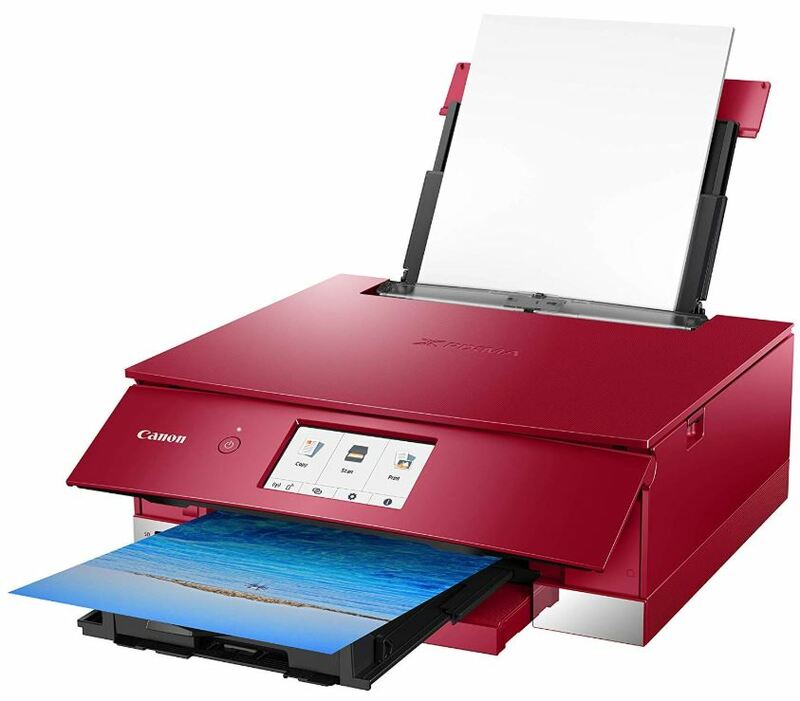 Consequently, the Canon TS8220 Wireless All in One is a good choice for someone who’s looking for a feature-heavy home office printer, that also has plenty of wireless connectivity options. I am very pleased with this my TS8220. Photos are impressive. One question I can’t find an answer to: the front tray retracts automatically but the front panel does not close automatically. Should it close automatically or does it have to be closed manually?